On Saturday we finally got around to visiting “The Real Van Gogh: the artist and his letters” exhibition at the Royal Academy. As the title suggests, the exhibition focused on Van Gogh’s many letters displayed alongside artworks tracing his progression as an artist. 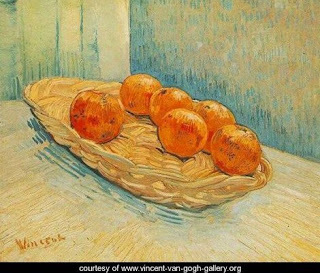 One of the first things I noticed was his early works were so different to what we envisage when we think of Van Gogh. They were pen and ink works, which he used to practise perspective and, in some cases, I felt that the sketches in his letters were better realised than the actual artworks. He progressed to working on figures, especially country people, with limited success. It was when the artist began, at the suggestion of his brother, to work with colour and a more impressionist style that his work began to come into its own. The vibrant colours and textures of his still-lifes made me want to reach out and run my hand over the canvas, especially his “Still life with basket and six oranges”. (above) It was at this stage that he began to pair blue and orange so effectively as he did in his paintings of sunflowers. The final few rooms centred on the artist’s landscapes painted in the last years of his life, when his mental state was deteriorating. It was so obvious that Van Gogh had a great love of the countryside and I couldn’t help but feel that he really did find peace in the pastoral. The cool blues and greens of his “Olive Trees” and the swirling leaves of “Cypresses” were two of my favourites in the whole exhibition. The last room, which included his last, unsent letter to his brother (carried on him the day he shot himself), showed an artist at the peak of his creative genius. At this time, he was painting more than a canvas a day including the beautiful “Ears of Wheat” and “Hospital at Saint-Remy”. The pairing of Van Gogh’s letters with the associated artworks really did give an opportunity to understand the artist as a person. Even with my rusty knowledge of french, I could get an idea of the concerns in his life – even down to him finding a restaurant where he could eat for 1 franc. I genuinely felt that he was concerned about being a burden to his brother (who was his patron) and it was this that lead to his suicide. I felt he was an incredibly intelligent person fighting with inner demons at a time in which there was nobody qualified to help him. I think this exhibition has to be one of my favourites of all the art exhibitions I have visited while living in London. I left with a new found respect for an artist who I previously associated with sunflowers and madness. Seeing the actual paintings allowed me to appreciate the vibrant colours and textures more than I ever could looking at pictures in a book. It is almost unbelieveable that Van Gogh produced so much art (over 900 paintings) in less than 10 years. In many ways, it was only to be expected that he burned out and was reaped when he was ripe (a symbolism inherent in many of his paintings).